This week I finished reading Unravel Me by Tehereh Mafi. This is the 2nd book in the Shatter Me series. I wrote about book 1, Shatter Me, here. In the sequel, “Juliette has escaped to Omega Point. It is a place for people like her—people with gifts—and it is also the headquarters of the rebel resistance. She’s finally free from The Reestablishment, free from their plan to use her as a weapon, and free to love Adam. But Juliette will never be free from her lethal touch. Or from Warner, who wants Juliette more than she ever thought possible. In this exhilarating sequel to Shatter Me, Juliette has to make life-changing decisions between what she wants and what she thinks is right. Decisions that might involve choosing between her heart—and Adam’s life.” There is a new twist on the love story between Juliette and Adam, plus there is more twists regarding Warner. Juliette also discovers more about her power – in the past she only know that her touch kills. Now she finds out just how powerful she actually is. I found this to be an excellent sequel, revealing enough to not leave me confused, but also so that I still want to read more. I am currently reading The Secret Life of a Submissive by Sarah K which is a memoir that is being released next week and I am reviewing for TLC Book Tours. Come back next Friday for my review! So far, the book is similar to 50 Shades of Grey, but it’s written better and is true. I wish I could think of something…I’ve never really had a book that changed my life. One book that I read awhile ago that has a good message is A Year to Live: How to Live This Year as If It Were Your Last by Stephen Levine. I should probably read that book again now that I’m older. I will usually recommend The Time Traveler’s Wife and a newer book that I loved was 11/22/63. 4. What are the top 3 books on your “to-read” list? I have 32 books on my current to be read list on Goodreads. They aren’t rated any one above another really. 5. What do you “do” while reading? (i.e. listen to music, eat) Any weird reading habits? I don’t do anything while I’m reading. I just lie in bed or sit on the couch! 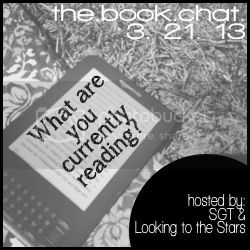 I’m also linking up at the Book Chat – but for the answer to the question see #1 above!